Rounding out the top three is people who work out in the wrong shoes for what they’re doing. When you wear shoes that aren’t designed for an activity, it can be hazardous to your health and safety. Plus, our feet do the dirty, unglamorous and thankless job of carrying us through the day, providing a sturdy base of support. It’s exhausting! And how do we thank them? By cramming them into non-supportive, improperly-cushioned, and often ill-fitting shoes. Look, I‘m a modern woman so I won’t judge anyone for what you do to your feet in the name of fashion – I mean girls just wanna have fun and all that – but I draw the line at ill-advised workout sneakers. Remember last month’s workout bling post? Nothing cute about injuries and blisters. And, while, I’m certainly not going to stand in the way of shoe shopping for the sake of it, let’s talk about those times when you actually must wear “the right” workout shoes — you know, in case you really do need an excuse to buy more shoes. Running. 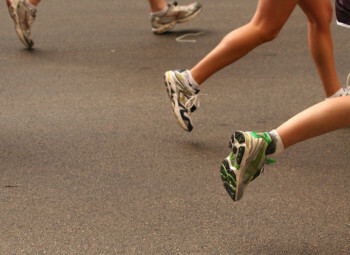 More people quit running for issues that can be easily remedied with a decent pair of running shoes. Take the time. Go to a specialty running store for an evaluation and fitting; running shoes should address the level of cushioning and stability you need as well as the shape of your foot. Unlike most sporting goods or shoe shops, specialty running stores typically allow you to take shoes for a test run outside, around the block or on a treadmill, and even exchange those new kicks for a different pair if you end up hating them. Walking. Contrary to popular belief, running and walking are not the same movement; therefore, you shouldn’t wear the same shoes for both. Walking shoes are heavier and stiffer than running shoes but they are also more supportive and allow for a greater range of motion through the foot. Hiking/Trail Running. If you plan on going off-road, you need more traction and support than a pedestrian shoe can offer. You also need better drainage and more protection against toe stubs and sharp rocks. Trust me, it matters. Cross Training. The multi-purpose workhorse of workout shoes isn’t appropriate for regular running/walking but does offer many things that running/walking shoes do not – like greater support for side-to-side movements which helps to limit ankle injuries, and more flexibility in the front of the foot for more control when you change direction. This is the perfect type of shoe to wear when you’re doing many of your AcaciaTV workouts. Sport-Specific. One look at a cycling, court, turf, or dance shoe and it’s clear that they have almost no application or practicality for any other activity. Each is specifically designed for the terrain and precise movement patterns required for the activity and necessary to prevent injury. So here’s my rule of thumb: If you participate in any activity at least 3 times per week, invest in the proper footwear – invest in you. Don’t just grab the least-expensive pair, the pair your sister is raving about, or the best-looking pair on the shelf and think you’re all set. Take the time to find the footgear that really, truly works for you. Have you been guilty of wearing the wrong shoes during a workout? Confess to me on Twitter here and here. I promise to go easy on you.